This is our personal story of how we removed a mole. We are not medical professionals, nor should this post be construed as medical advice. Mrs. Crumbs and I have come to really like using apple cider vinegar (ACV) for a variety of reasons, including a daily detox drink and as a homemade produce wash. We even figured out how to make our own homemade apple cider vinegar! We’re all about using homemade remedies whenever possible. We’ve healed spider bites using a potato, healed acne with bentonite clay, created flea and tick dog collars with essential oils, made our own homemade bug repellents and even figured out how to heal gum disease naturally. Today, we’re documenting an apple cider vinegar mole removal tutorial. If you can’t tell by the look on my face, I’m not exactly thrilled to have these “epic” photos on the internet. But it is important to display the magnitude of how large this mole grew over the years. I’m also willing to suffer for the greater good of everyone else removing moles with apple cider vinegar at home. 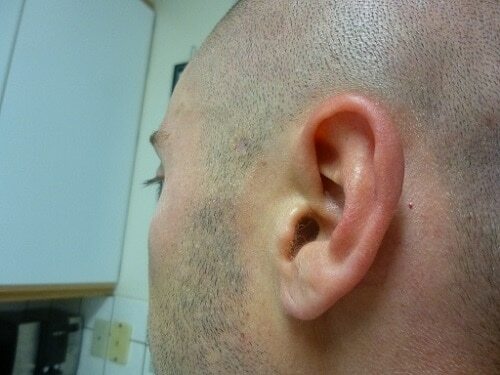 For as long as I can remember, this mole started out as a tiny speck near my ear. Obviously it has grown substantially over my 30+ years on earth. This mole constantly got in the way of haircuts and would ALWAYS get nicked by clippers. It also caused my hair to grow sideways – yes, parallel with the ground (which was very annoying). Just a few days after a haircut, there would be 3 or 4 hairs sticking far out of my head because of this mole! To make matters worse, every year I went to the doctor for a physical, the doctor would always say “let me remove that for you” or “let me zap it!” No, thank you. It wasn’t changing color and having it frozen off my head didn’t sound fun. Wanting the doctor to leave “the mole” alone, I set out to find a more natural or holistic way to remove this guy. “How to remove moles naturally” led to all sorts of Google generated responses, from expensive topical creams to using alcohol. Apple cider vinegar mole removal is a pretty common one too. Plus we had some high quality apple cider vinegar in the kitchen cabinet. It seemed to be the least painful method, so Mrs. Crumbs and I thought it was worth a shot. When it comes to natural remedies, it’s good practice to use the highest quality ingredients you can find, and afford. As the level of processing goes up, the benefits of ingredients goes down. So ideally, you want your ingredients to be raw and unprocessed whenever possible. Adding factors like non-GMO and organic are good, but they’re not necessary and they make the price tag go up. Thrive Market – The famous Bragg apple cider vinegar is 18¢ per ounce, but if you don’t care about brands, the Thrive Market brand is the best bet at just 14¢ per ounce. Thrive Market requires a yearly membership, BUT you can get a free 30-day trial here AND a free jar of organic coconut oil when you shop through this link. Various sites returned different protocols and instructions on how to implement the apple cider vinegar method. Not wanting a band aid on my head at work, we decided that the apple cider vinegar mole removal process could be done at night while sleeping. Dip half a cotton ball in apple cider vinegar, saturating yet squeezing out excess. Apply the cotton ball on top of mole. Use a band-aid to secure cotton ball over mole. Leave the secured cotton ball on the mole for up to 8 consecutive hours each day. Continue steps 1 though 4 until mole scabs up and falls off. Note: Although weak, apple cider vinegar is acidic and it may cause skin sensitivity. Using apple cider vinegar to remove a mole also creates a “wound” on your skin, just like a scrape or a cut. Treat it like a wound, keep it clean and use your best judgement as it continues to heal. After day 4, we decided not to apply any more ACV to the area. We weren’t really sure what was going on, but it appeared to be working. Additionally, the area around the mole became a little red from the vinegar because it’s acidic. This method was painless. Maybe a little irritation from ripping the band-aid off of my scalp, or from the apple cider vinegar on the skin, but it was easy and I would definitely do it again. Note: Although I did not experience any skin sensitivity to the ACV, some readers who tried this felt some burning and skin irritation. Using Aloe Vera or Coconut Oil around the mole before or after application of the ACV may help. If you experience pain that seems out of the ordinary quit treatment immediately and let your skin heal. UPDATE: Here’s another couple of shots, now 8-9 months later. And that was pretty much our view too, until it worked! 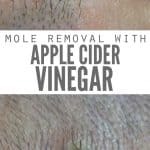 The apple cider vinegar mole removal process appears to be relatively safe, and you are not applying harsh chemicals on your skin. If you are looking for an alternative to mole removal, you might want to give this a try! Manage Seasonal Allergies: Similar to treating a sinus infection with apple cider vinegar, mix 1 tsp with 2-3 Tbsp water, gargle for 30 seconds and swallow. Repeat twice daily, or up to four times for more severe allergies. (Mrs. Crumbs did this and her symptoms were gone within two days). Rid Croup: My son had a strange cough that included no other symptoms. We waited for a week to see if the cough would go away, but it didn’t. It was harsh, loud and often. We gave him the same remedy as the sinus infection and his cough had reduced significantly within one day and was completely gone within three. Regular Immune and Detoxification Support: Heather from NeverLackingZeal found a way to incorporate ACV into her regular routine to boost her immune system and detox daily. Check it out right here on Crumbs – DIY Apple Cider Vinegar Detox Elixir. Common Cold: Katie Mae at Nourishing Simplicity created a “knock your socks off” cold kicking cider. The vitamins, antioxidants and phyto-nutrients are powerful and WILL kick your cold to the curb!! Bug Repellent: We make our own bug repellent with essential oils (Note: I know there are a lot of essential oil companies out there and I’ve certainly tried my fair share of brands. But after testing and researching and more testing, only one is worth spending money on (in my opinion). For a couple years now I’ve been committed to Young Living oils, and you can read more about their oils and my decision HERE.). However, readers have suggested that drinking just 1 teaspoon of apple cider vinegar on a daily basis has kept bugs away too! Homemade Conditioner: Just 1 tablespoon and warm water can replace your typical shampoo. Not only does it work, but this will save you TONS of money too! The anti-infective properties of ACV are amazing! The studies on vinegar show that it can help with a wide variety of infectious issues. Anytime you’re thinking about healing something naturally, definitely consider apple cider vinegar! I removed a mole with apple cider vinegar! I know it sounds a little crazy, but it works! Typically we make our own apple cider vinegar using this method, but for this home remedy I used Bragg’s raw apple cider vinegar. (You can find it for a great price HERE.) I also recommend this brand and this one for their quality. I also recommend a little aloe vera or coconut oil around the mole you are trying to remove. This helps with any sensitivity you may experience from the ACV. I LOVE when one item serves multiple purposes. Apple cider vinegar is no exception! I use it in the kitchen for cooking, but also homemade conditioner, a detox elixir, and now mole removal! Have you tried to remove moles using apple cider vinegar? What was your experience? Share your thoughts and ideas in the comments below! Wow! I’ve paid hundreds of dollars to have moles burned and cut off by a doctor. Not only was it expensive (insurance did not cover due to being elective), but it was painful too. Thanks for sharing this, I’ll be giving it a try. I’M ON DAY TWO OF REMOVING A PINK MOLE ON MY FOREHEAD AT THE HAIR LINE (QUARTER INCH SIZE)AND IT IS ALREADY TURNING BLACK AND IS GETTING FLATTER. APPLE CIDER VINEGAR IS WORKING GREAT. i HAVE SEVERAL MORE MOLES I WILL BE WORKING ON. THANK YOU SO MUCH. I HATE GOING TO DOCTORS. Great job Sharon! You’re most welcome! Hey how many days will it take to apply ACV regularly to remove mole. I’m going to try this as well. I have a mole right in the middle of my forehead! It’s so annoying, it has got to go. I am a true believer in Bragg’s ACV with the mother. Repeat the same instructions for getting rid of the mole but use these instructions to remove large, hideous wart (not planter’s warts- have not tried on a planter’s wart. Just remember to leave the cotton soaked ACV and band-aid covering the wart 24 hours a day and change every other day. Wart will fall off with no Trace it was ever there. My son was a life guard and he was mortified that he had a large hideous wart as big as a pencil eraser in every way. Within in 2 weeks it fell off with pristine skin underneath. He was a huge skeptic. He was amazed! I have decided to give this a go.I have had a raised noticeable mole on the left side of my neck for a while. So tonight I have put a soaked with cider vinegar cotton bid tip under a plaster. Fingers crossed. i am doing 1st one now. I’m doing this too except mine is on the ride side of my nose next to my nostril! I hope this went well for you! How much apple cider vinegar did you end up using in the end? I don’t remember Vicenta, but it couldn’t have been more than a couple Tablespoons worth. Question: I have one on my chin, and I work in a professional environment, so I wear make up every day. I would like to try this but I would have to do it on the weekends and at night. How will it affect me wearing make up though around & on it to cover it up? I guess what I’m saying is what will it look like when I don’t have that stuff on it and it being on my face? Most vinegars will be diluted to that ratio Harry. Success on all fronts. This stuff in it’s raw form has been used for millenia to cure what ails. I am going to try to make my own from organic red apples just like Bragg does. Making my own ACV is on my autumn to-do list as well Moxie. Glad to hear it’s been working for you in so many wonderful ways! Hi Moxie I just wanted to ask you how did you removed your sunspot with the Acv .? Wow – this actually works? I’ve read about this in the past, but was too chicken to try it !! Tell Mr. Crumbs “thank you” for being the guinea pig. The pictures really help us all see how the apple cider vinegar removes the mole. He did this on is head, so I’m very curious if you can answer if hair still grows on that spot. I have successfully removed a dark brown mole on my forehead with ACV. It’s been 3 years and the scar is completely gone. Only warning is try not to let the ACV sit on your skin around the mole. It will burn it and create a bigger scar. I’m curious if you can answer my question because I have another in my hairline right in front and am worries it may burn my hair follicles and create a patch there. Please let me know, thank You! This is a very good point that I didn’t appreciate until day 4 into a 3/8” mole (not quite a typical dark mole but not anything that appears harmful either). The cotton ball was soaking skin around the mole with the raw ACV and causing it to get vey “irritated” – I’ve stopped for a day to allow healing of the surrounding area then will plan to resume in a more targeted fashion. Hoping this works as in the past I’ve had other removals that had to be done by dermatologists at considerable non-insurance-covered expense. I first saw this idea from Dr. Mercola’s website, with other options mentioned like lemon juice. Hmmm…do you think this would work for skin tags too? They have been bothering me for years. For skin tags, our family has had success with tying a loop of dental floss tightly around the base of the skin tag. Just leave it tied on tightly,and the tag should fall off in about a week, often less than that! 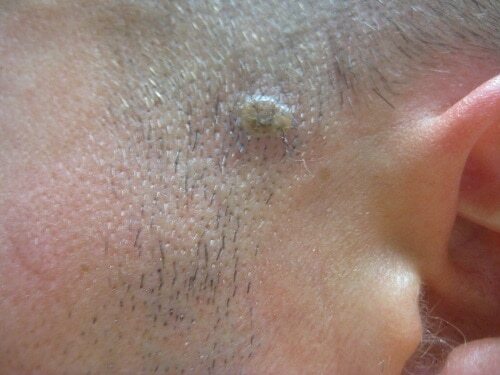 For skin tags, a paste made of equal amounts of caster oil and baking soda work well. Just apply the paste and cover with a band-aid. Thanks Norma Rau and Audry! I tried this floss method and was in pain for a week before wishing I didn’t do it. I tied a piece of floss around the base of the mole and pulled tightly to cut off its blood supply. The next day, ow ow ow I was feeling a stinging sensation. After putting up with it for a week I tried to untie the floss but I couldn’t. Its been on there for 2 weeks now and the mole never turned black and didn’t fall off. I’m still in pain. Now I’m using the Apple Cider Vinegar method which I hope kills the mole and takes the floss with it when it falls off. I really hope this works! Sorry to hear things are not working as you had hoped. If you read the post about the dental floss, you will read that it is being used on skin tags, not recommended for moles. I think sticking with ACV will be better for moles. Whoa Jen! I’m so sorry to hear you’re in such pain! Is there anyone with steady hands who can try to cut the dental floss without cutting you? So I have a raised mole on the side of my head in my hair…will the acv treatment to get rid of the mole make my hair fall out in that area as well?? Lol….I tried this method with cotton but the mole just strethced longer! My doctor told me to just get a sharp pair of scissors and snip them off. It worked a only one out of five grew back. Didn’t hurt and only bled a small amount. I’ve been applying Liquid Bandaid on my skin tags for years and they fall off in about a week. Trying the Bragg’s now in some moles. I used ACV on a wart and it disappeared. But put some kind of petroleum jelly (or un-petroleum jelly) around the area because I ended up having a huge scab around the area from the acidity! That scab hurt more than the wart in the first place…but now they are both gone, so that’s wonderful! Wow, it’s crazy that only took 4 days! I think I have read that, but it does help credibility to have the pictures to prove it. Very cool! Much quicker than we thought it would take Andrea. Thanks for hosting! Wow! ACV never ceases to amaze me! Looks like I’m going to need to try this out! Thanks! I would definately research black salve. As I have read that things can go wrong real fast with the black salve. I have been holding on to Acv I doing 2 top in the am and p.m. initially I purchased it to rid me of my mole on my nose, but I am really scared of the scar it may leave so I haven’t used it yet! I have used black salve to draw out cysts with success, but never heard of it for a mole! I never really had moles, other than 1 or 2, but once I became pregnant I was covered overnight, especially on my throat and chest. I am desperate to remove them! I cannot see me allowing a doctor to freeze or cut that much of me. ACV is incredible! I removed 2 of my moles and I still want to do more (pesky little things).I guess I should get on it? I have to say that at the time of removing, I just wanted them gone, so I burned the skin around on accident, now realizing I should cover the skin with vasline or another sort of protection. Another thing is that one of them started growing back! I guess I’ll just do it again when it gets bigger? ACV also works very well on athlete’s foot. Soak affected foot every day for about 10 minutes — symptoms should be gone in about a week. Wow! I’m going to have to try this! I have a mole on my chest that bothers me, especially during the summer when I wear v neck shirts and tank tops. Thanks for sharing! Thanks for this tip. My husband read it too and we’re going to try it on a mole that he has in a similar place to yours. We appreciate the info and hope it works for him as well as it did for you. I have a growth, that is scar tissue. It looks like a 1/2″ oval growth. Dermatologist biopsied it, it was fine. She then proceeded to slice it down with like a scraper of some sort (of course I was anesthetized)babied the scab, etc. She said there was a possibility that it may grow back. Sure enough, it grew back just as before. I’m going to try it. I’ll let you know how it turns out. I see on your hubby, that there was a slight depression after the mole was gine. Has that filled back in? Another poster mentioned something about a yellow salve to help fill in, do you know anything about that? I’d hate to have a depression on my back to replace the growth!! You know, summer wear. Rubbing olive oil on a scab then coating with mashed avocado will help the scabbed area. Olive oil has antibiotic properties and avocado helps tissue growth just place gauze over it at night wipe off in morning. Worked on 1300 stitches on my face and I sanded the scar tissue with wet dry sand paper gentle first then applied the olive oil and avocado. 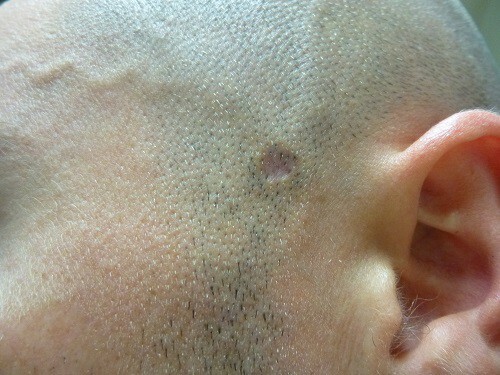 I have a huge mole on my neck I will use avc tonight. Will send before after pics. This is fascinating! I have some moles I’d like to remove; I’ll definitely give this a try. And thanks for linking up to Healthy 2Day Wednesday! Thanks Anne! I see that I was featured – a big hug and thanks to you! You’ve got me wondering if it would work on skin tags too. May have to research that. Would be a lot easier than going to doctor and I LOVE the benefits of Apple Cider Vinegar. I’m totally going to try this! Wonderful! Let us know how it turns out Rebecca! Vinegar kills ringworm, as well as athlete’s foot as another poster mentioned. Both ringworm and athlete’s foot are caused by a fungus and vinegar kills fungus. My son had ringworm once and after three trips to the doctor, three different diagnoses and three expensive prescriptions, I finally listened to my grandmother. She kept saying it looked like ringworm and I should put vinegar on it. Sure enough, after two days of swabbing the spot with ACV, it cleared right up. I’m guessing it would work for your cat. Side note: I grew up on a farm and we always had plenty of barn cats. We couldn’t afford to get them regular vet treatments so my mom would worm them with cloves of garlic. Makes the critters reek of garlic but we had the healthiest cats. Since this post, I was inspired to remove 5 of my moles (yes I have many, but it’s not a gross as it sounds), it is taking longer, don’t know why? But is IS working. I am on day 6 and only 2 are starting to turn black half way; they are on my arm pit which is really irritating the skin because of the movement, well the tape is what’s irritating. I slathered honey on my skin for 2 hours (it’s what I do for burns and since it feels like a burn I thought it would work, and it did) avoiding the moles, then washed off and put coconut oil on the sin around the mole. this has really helped, it doesn’t hurt as bad as it looks:) Then at night, I am doing the ACV. The others are just beginning to show a difference, but I’m going to keep it up. So, I hope this info helps anyone who is trying and not seeing results right away. Im going to try today a pencil eraser size mole by my left ear under my glasses its looks full of liquid is it just wondering…. I have the exact same mole on the opposite side!!! I’m going on 30 and every summer, mom tries to hold me down and pull it off, thinking it’s a tick. I have to remind her that as my mother, she should remember its just my weird head mole!! She hasn’t tried it yet this year, so I’m goin to try and make it disappear before she does!! As a stage 3 melanoma survivor, I would caution everyone to have a doctor remove suspect moles (http://www.skincancer.org/skin-cancer-information). If it’s just a cosmetic issue, this method is ok, but if it’s suspicious remember that a mole could be the fist sign of a problem. Mine started as a mole and melanoma was already in a lymph node. May is skin cancer awareness month! Thank you for reminding us Anne – the standard color/size/change issue should always be evaluated in case the mole is more than just an ugly lump. 😉 Blessing to you! Anne, I am glad you made this point. I worked in dermatology for over 11 years. It is really important to have moles checked before doing the ACV treatment, just to be sure they are benign. This treatment looks great and definitely will save money over the surgical route, but better to be certain it is a simple mole. As for skin tags – I use a little curved cuticle scissor and tweezers – tweezers to pull the tag away from my skin, and the scissors to snip. Sounds painful – it is just a little pinch and then it is done. If you like, use one of those styptic pens to stop any bleeding. Quicker and less painful than the ACV treatment, but only if you can do it. Naturally, I wipe the area down with alcohol and sterilize my instruments – common sense rules. I concur with this method for skin tag removal. Another method (that worked very well for me – for those tags that are easy to reach) is to use a sharp toenail clipper. Of course, your cutting tool should be sterile.Just bring it close to the base of the tag, and squeeze until you can feel some discomfort, hold for a couple seconds, then squeeze a little more, following that procedure until the tag is simply cut off. A band-aid applied and you’re done! I wanting to remove a mole under my pits it have gotten bigger and irritated when i wear my bra.im on my 2nd day of the experiment.really hope it work for me. Good luck Cassandra!! I hope it works too! 4) Eat banana… who doesn’t like bananas? I agree with #4 🙂 Thanks for sharing! You should not kill spiders. They are part of our ecosystem and very valuable in reducing many bad bugs. Please don’t think it is funny to kill them. I have a mole on my chin. 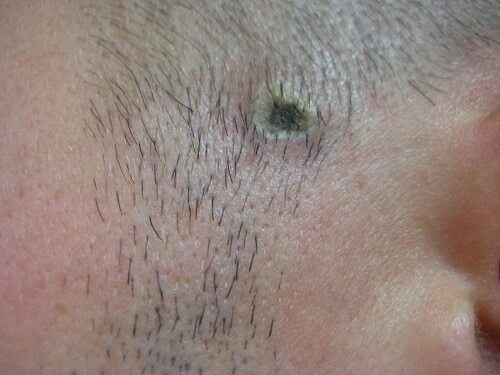 Have had it removed once beforehand by burning it off…yuck! I think I will try this! Thanks for the visuals! but i am frightened now because someone told me an incidents about removing moles that it can lead to death.. Interesting! And for those that have mentioned skin tags, I have successfully removed those with frankincense EO. You need to use the Boswellia Serrata variety though. Apply to it the tag 2-3 times daily, getting at the base of the tag. I had tags for years – really, decades on several – when I came across this online an decided to try it. I had to be careful with the tags on my eyelids, and it would sting for a few seconds, but it worked within a week. That was about a year ago and no sign yet of them growing back (doctors say they tend to do so). Tags usually appear in folds of skin and abrasion triggers them, it’s believed, as well as toxicity. So if you’re changing your diet for the good, they might not come back! I used ACV to get rid of gallstones. As it turned out, they were happening as a sign of hypothyroidism. But a quart taken over 3 days knocked the worst of them out. I used canned air to remove a skin tag. I just turned the can upside down, it freezes when you spray. Then I just cut it off. I’m gonna try this on a mole that’s not so visible, and if that’s successful, maybe move on to one on my face. I am trying the Remove moles with ACV. It is working!!!!! I am in Day 2 and my mole was larger than Mr Crumbs. It was an above the skin mole and my babies used to pick at it. It seemed to be getting larger so I googled how to remove moles and found your website. I am so thrilled!!! I have a couple more that I will need help with cause of the location. But the one I am working on now is in the bend of my arm and it is now just starting to look like the one Mr Crumb had. Thank you soooo much for posting this information. My finances are tight and I can’t afford to run to the Doctor for every little thing. PS Next I have a few skin tags that are irritating. Would it work on that? Way to go Robin! You are most welcome! It worked!!!! After 4 days it was gone. I have a tiny pink mark where the mole was. I am working on the one on my back now, but there is not always someone home to apply it for me. So it is taking a bit longer plus it was much larger than the one in the crook of my arm. Question: did you squeeze the excess AVC from the cotton ball? Because the AVC does tend to irritate the good skin around the mole, I have been cutting the cotton ball down in size too. Thanks again for sharing!!!! I have a very ugly mole with hairs growing out of it on the side of my face. I was wondering if acv will have any effect on the hair? If not, do you know of any additional steps or ingredients I can use to help reduce/stop the hair growth with the mole removal? Once the mole is gone you can tweezers out the hairs. Over time they will thin and stop growing back. We just updated the post with a couple pictures from just this past week. Keep in mind that we’re getting EXTRA close for you guys so you can see how it looks. I can hardly tell it’s on his head to be honest. I have some acne scars from my younger days and his former mole spot looks WAY better than those, if that helps to gauge any. I recently attempted this on a couple moles. The end result is that I’m left with two raised bumps which are about the size of the mole, however they are definitely not as raised as the moles originally were. The bumps are redish, and don’t seem to have the pigment the mole used to have. I noticed in the picture you ended up with a hole in the skin… I don’t remember this occurring for me. I remember the mole being drawn out of the skin then popping off. Any suggestions on what I should do to remove this bump left on my skin? I’m not sure if it’s raised due to there still being some mole left, or if it’s raised because it’s a hypertropic scar. Either way I’ve been using silicone sheets to hopefully flatten it… but no results after about two weeks. I recently watched some fascinating yet extremely gross videos on black and yellow salve. Apparently black salve can remove foreign growths (cancer, tumors, etc.) and stings like mad. Yellow salve promotes healing and is soothing. If the bumps don’t bother you, I’d suggest leaving them alone. If they do, I’d try another round of AVC first. If unsuccessful, then I’d try yellow salve, only because it’s not suppose to hurt. If neither work and the spot isn’t harmful, I’d just deal with them. I don’t know if black salve would work if the spots weren’t foreign, and if it did, it looked very, very painful. Thanks, I appreciate the reply. I too was actually watching some videos on the black salve. It looked a bit too much for me, the hole it created in his face was pretty brutal. I’m probably just going to leave it alone for now and see what it does. If there’s no improvements in a month I’ll likely see if I can get some laser treatment to flatten the skin out. Hi How excatly do you use it , i have been dabbing in on then puting a plaster on it and it for 2 days and its bigger than before but nothing else am i doing it wrong and how many times do you have to put it on and for how long before you put a plaster on . any info you would give me would be great as i dont think mine is working . A plaster is a band-aid. And K, are you saturating a half cotton ball and holding it to the mole with a plaster/band-aid for 8 hours? Or just dabbing the vinegar on and then putting a band-aid on? i tried this on a flat mole and it definitely works! 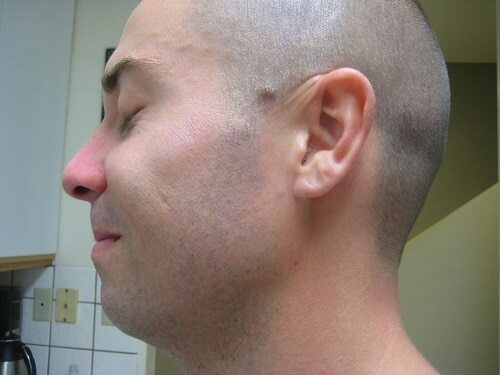 but there was a dark hyperpigmentation after the mole was gone. it has been there for almost half a year now 🙁 also, how do we know when the mole is about to scab? Great informative article! I’m a guy ( like your husband with the mole on the side of my head ) I’m going to try this method, it sounds simple, easy, and that it works. After day 4 when you stopped using the ACV because of the dark spot, did you use it again at all on the area? And When he got his hair cut for the first time after the mole falling off, did it affect the area? I’m very excited to try this, and use ACV for other uses! Thanks for posting! Hi Tiffany, do you think the ACV would work on those pesky little red dots that appear out of nowhere – they are called cherry angiomas. Amazing! I just had 3 moles removed today by the dermatologist and decided to google “natural mole removal” and found this! I have several moles that I still wanted removed but didn’t want to shell out the $$ today. What a money saver this will be and probably a lot less painful. I have a small mole (anout half the size of en eraser on a pencil on the band of my neck. Am going to try this tonight and see if it works for me. In order to get it removed, they told me it would cost m $400!! Just to use a scalpel and remove it! No way am I paying that much just for a small nick. Thank you for posting about this, I will update in ~5 days. Just wanted to say thank you for a great informative post! I love that you answer almost reply! I have a mole that appeared about 10 years ago right underneath my eyebrow. It has grown in size and I consider it gross. I very much want to try the ACV method, but too am a bit concerned about an indentation left on my face. It still would probably better than this hidious mole, though! :) I too love Braggs, though currently have Trader Joe’s ACV in my cupboard. You keep refereing to Braggs having the “mother”. I am wondering what this is. I will give this method a go!! Glad I can do it only at night. Love, love, love natural remedies!!! I will try to find Braggs ACV, but if I won’t find it, will it be ok to use any other ACV, I mean not organic? You do not need organic acv. I bought the Kroger brand for $1.29. So far I’ve removed 4 moles. After reading your post–I tried this on a mole on my forehead. I’ll admit I was nervous about trying it on such a “public” place, but I couldn’t deny your results. After few nights, the mole turned black. A day or two after that, I absentmindedly rubbed my forehead and felt something fall to the floor. I ran to look in a mirror and the mole was gone! The mext day ir felt like a small bump had returned but while washing my face it fell off and nothing has come back! There is no indentation–just flat forehead! I showed my doctor and she didn’t believe a mole had ever been there! This was wonderful. Thank you so much for posting this–I have wanted that mole removed for decades, but I was afraid of the dent the dermatologist would leave behind. Thank you, thank you! And to think, I came to your blog because we love Nourishing Traditions and wanted to hear other experiences people were having with it and now I hove gotten so much more from you. Keep blogging–we look forward to each new posting! JULIE! Congratulations on a successful mole removal! How awesome that you have no remnants at all! Did it!! I have had a little mole in my armpit my entire life. It has never changed, but occasionally I shave over it and knick it a teeny bit. So, i tried this and it is GONE!!!! Next, one on my back that is right at my bra strap line and is annoying. I CAN’T WAIT!!! Aaaaand the one on my back is gone, too!! Eeekk!! I love this method! Way to go Beth!! WOO-HOO! Does it work on flat moles?? Selena, did you get a crater from the flat ones or they simply flaked away leaving the skin without a trace of a flat mole? Hey Leslie! For the flat moles, there are no craters, just skin flaked away showing some hyperpigmentation spots. Hyperpigmentation spots are a lot easier to cover with foundation/concealer than a black dot, however, for me those hyperpigmentation spots take a long time to fade and I have like 8 flat moles on my face. Sigh. Best of luck! Just wanted to give a quick update on the mole on my neck. I would [b]NOT[/b] recommend using black salve to anyone unless they have cancer, tumor, etc. I would NOT use on a mole though!!! It is very dangerous stuff to use and extremely painful. is it possible to get rid of redness at the place where the mole was removed? yeah i removed a flat mole and there’s a dark red hyperpigmentation there. i mean eventually it’s going to fade out over time but it will take a very very long time for me. i bought this thing called glycolic acid and it’s supposed to exfoliate the skin so that place can heal faster. i haven’t tried it yet but i hope it speeds up the process! I’ve heard of glycolic acid in use for acne, but not in other areas of skin care yet. Let us know how your experiments go Selena. My husband’s has faded significantly now 9 months later. You may want to consider giving it a month or two to see what happens. Maybe it’ll heal sooner than you think! I have heard about gel “dermatix”, it heals scars, will it work to remove redness? I am going to buy it. I haven’t heard anything about “Dermatix” Cain, but if you try it, let us know how it goes! We’re glad to have you Bonnie! Keep us updated on your mole progress! Really like what you’re doing here on crumbs! just have a little question. I’m sitting here reaking of vinegar and I’ve been doing this for a couple of nights in a row on a flat mole on my chest. But it doesnt seem to go any further than it has on the “day two picture” in your guide here. And that makes me wonder if my vinegar is strong enough? It says on the back of the bottle that its 5% “strong” vinegaracid. You think that should do the trick? I couldnt find anything stronger. I should add that I couldnt find an unfiltered and/or organic brand of ACV.. Could that be the reason its going so slow? Our ACV says 5% too, so I’m betting that’s industry standard. The filtration/organic variety shouldn’t make a difference in effectiveness (we just recommend organic and unfiltered because there’s no chance for the body to filter out anything bad before absorption). PS – love that you’re visiting from Sweden! Thank you for the quick reply, Tiffany and Selena! Then it seems that my mole is just a stubborn one 🙂 I’ll continue a couple of treatments more to see what happens. Its a flat 0.2 by 0.2 inches in size so I guess its slightly bigger than average (for me anyways). Is there some kind of “tell” to show you when youve done enough treatments? Cause I guess its not too good to go on for too long since its acid after all. Selena, I too did stray a bit from the method described here and did something along your lines. I scratched the mole a bit before applying the ACV the first time since it didnt do anything at all if I didnt scratch it. What kind of bandage did you use by the way? I’ve noticed that my bandages stick fairly hard to the skin, but doesnt stop ACV from leaking inbetween the adhesive and the skin affecting the surrounding areas aswell, and then when removing the bandage the adhesive takes small bits of skin with it because the surrounding skin has been affected by the acv too. Kinda hard to explain, but afterwards it looks like there are tiny cuts around the mole. I tried thumbing the adhesive on the bandage before applying to make the bandage easier to remove, but that only makes it harder to get it to stick without excess ACV bleedin through all over the place. Hey Nick! I use the First Aid bandages from Walmart. Lol. Are you talking about like your bandage is too small that the sticky part(the flaps)are partly touching your affected area? I usually put like lotion before I go to bed/ put on the bandage so I let the lotion almost dry and then put on the bandage so there the glue from the handles don’t completely stick on to my skin. I think this is the question you’re asking about?? Sorry if it isn’t. Lol. Hi Selena! Where I live unfortunatly we dont have Walmart. I continued the treatment with a few adjustments. I read on some other source thet they only applied the ACV for an hour or so once in the morning and once before bed. I put vaseline around the mole and then just kinda laid the ACV cottonswab on the mole and it stuck there by itself (cause of the surrounding vaseline and cause it was wet from the ACV I guess). Had it on for a few hours without any bandages. that was a few days ago. stopped applying the acv since it was starting to look like an ordinary scab. and last night in the shower the mole fell right off! 😀 so I too can confirm that ACV works on Flat moles! Mine was around 0.75×0.75 cm2 in size. Its too early to see if it’ll be any scarring but I will try to remember to let you guys know in a couple of weeks! Do you guys have any tips on anything to help the healing process/reduce chance of scarring? anything that can be bought over the counter at the drugstore or something? And once again, huge thanks for this guide that made it possible for me to get rid of my mole! This was the first in line to go! But it wont be the last 🙂 Mr. and Mrs. Crumbs, You Are Awesome! Great news Nick! Tea tree oil in general helps to speed up the healing process and reduce scarring, but we haven’t tested in on a mole yet. Feel free to be the guinea pig. 😉 This one runs about $13 for 2oz on Amazon, but you can find it locally as well. Don’t let the price tag scare you – you’ll use SO LITTLE that the bottle will literally last you years, and it’s good for any type of skin abrasion/cut. I’ve had mine for 10+ years now and I think I just hit half-way, lol. And you are most welcome!! Hi Nick! I actually removed a flat mole using apple cider vinegar, but I slightly changed the process from what Mr. Crumbs did. I searched up how to remove a mole on google and there were these other websites that had different ways and I decided to try them. What I basically did was scratch the surface of my flat mole with a sterile pin and dipped ACV on a Q-tip and bandaged it on. On the first day you put ACV on the newly scratched mole, there will be a tiny sting, but it will be worth it as by doing this, I only needed to put ACV on my mole for three nights instead of a week. Remember, I only scratched it one time (the first night I put ACV). So after three consistent nights of putting ACV on a Q-tip and bandaging it overnight, by the fourth day, it was slightly red and more black and it stood out among the other moles, but that is normal. So after the third night, it was pretty redish and so for the next couple of days, i just left it as is and let it scab. the bigger the mole, the longer it takes to scab but since mine was small/okay size, it took me three days for the mole to fall off. Reminder, don’t pick the scab, let it fall naturally! So once the mole fell, there was a red hyperpigmentation, but that is at least better than a black mole and plus, it’s easier to cover with foundation than a black dot lol. Im not saying this will definitely work for you cause everyone’s mole is different, but this is just from my personal experience. My moles were like sunspot moles lol. Anyways, best of luck! I am mole heaven – flat, raised…etc. even those pesky blood filled dots..ewww – I inherited it from my mom. By doing this I just hope I don’t get “craters” from them all. Thank you for showing photos of your experiment. I am also going to try the apple cider vinegar on a few moles. Will keep you posted. Looking forward to it Maria! Hi , I have done the acv method and it scabbed up and fell off however just wondering how long until it heals and also is there a chance it will grow back as I used the castor oil method a while ago and it worked but grew back! And do you recommend anything to prevent it from growing back? You can see in the pictures above what Mr. Crumbs’ mole looked like at 1 month and then a follow up several months later. There’s no telling specifically how long it’ll take to heal, but it should be doing better within a week or two like any other wound. As for growing back, I honestly have no clue! It’s kinda as random as to why some moles are extra stubborn. However, no one has yet come back to this post to say they used ACV and their mole grew back… ! 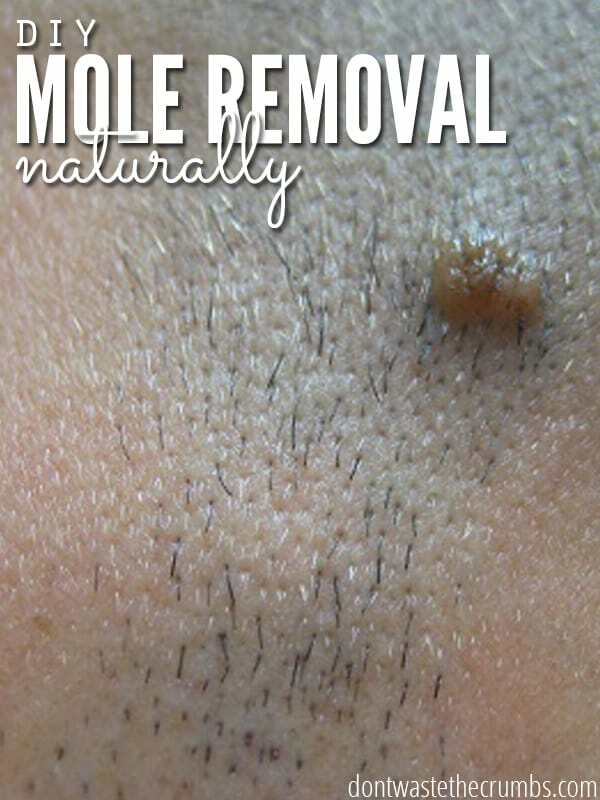 Thanks for the tips I will be trying this on one or more of my moles. Also I have had two kidney stones and I reduced pain and length of discomfort by mixing apple cider vinegar with a glass of water several times a day. It tastes pretty bad but it helps brake the stones down so that your body can pass them easier. Forest, for your Kidney Stones you can also take a glass of water with 2 large tablespoons of Olive Oil and 2 tablespoons of lemon (fresh lemon). I know this is off the topic of this post…but I just wanted to share that since I get them too and it helps them pass in some people. I also use Bragg’s ACV for stones. Apple Cider Vinegar really has a lot of health benefits. I haven’t heard about its effectiveness in treating moles, but I’ll have to look into it a bit further. Hello, I just have to say thanks for this blog! I have a few moles that have been driving me insane!!!! They just popped up during pregnancy and the one I had before had gotten BIG. I hated them. I tried the cotton ball and tape then bandaid but it hurt my skin and didn’t see much success. I think it was the part of my body it was on the tape didn’t hold well. Yesterday I decided to just use a few q tips dipped in avc and applied pressure while watching a movie. I’d push pretty hard and then re-dip my q tip until it bent and then used a new one. By the end of the movie the mole turned black and flat!!!! (And this mole was rather large. Much larger than your husbands. You could literally grab it between your fingers!) Today I worked on a mole on my side. This one took a little longer, but still only a day. I find that using the q tip works because I’m not making the rest of my skin raw with tape or avc. I would recommend trying this way if you have a weekend and a movie to watch! I am now covering it with Neosporin and waiting for it to scab and fall off. I appreciate your blog. Even though mole removal with avc is all over the internet. This was well documented and why I gave it a try! Thanks! Wow, it really worked! I surrounded the flat mole with vaseline (but should have surrounded it a little closer in hindsight). The whole area got pretty red after two nights of the method, and took about 4 days to scab over and fall off, but now the mole is basically gone! Just a bit of over pigmentation, but I applied some aloe and hopefully it’ll get lighter with time. will this work with regular white vinegar? or does it have to be apple cider vinegar? We did not test white vinegar, but I would not recommend it. I have yet to see any home remedy that calls for white vinegar. One question… did you scratch the mole before applying the ACV? You’re welcome! We did not, but I’ve that others have. Maybe try it first without scratching, and if nothing happens in 3-4 days give a scratch? Thanks again, and I’ll try my best to give an update soon. Actually, I had another question just as I finished my last post. Did you feel a sting when you applied the cotton ball of ACV to the mole? I’m guessing not because you didn’t scratch the mole prior to the application. I don’t think he did, but like you said, he didn’t scratch the mole. What I also noticed was that the area around the mole was darker the day after. Is there anything I can put on the mole to prevent this? Some people use coconut oil or lotion around the mole to protect the skin. Mr. Crumbs didn’t use anything (not knowing what would happen). do you think this works for flatter moles? I only have one mole that sticks up off the skin in a noticeable way, but I have many flat or almost flat moles that I’d like to get rid of. Other readers have had success with flat moles by scratching it first. It’s always worth a shot! No progress. Still like the Day 2 pictures. Day 4: My mole is black in the middle and has a ring of the yellowish color that Mr. Crumbs had in the picture from Day 2. I don’t know if this is normal or not. Perhaps it’s just taking longer than others? I wish I could offer more… it’s been a few days – do you have another update? I am an absolute believer in the benefits of apple cider vinegar for dealing with skin problems. I have been visiting doctors for years and having pre-cancerous skin lesions burnt off with acid, frozen off with nitrogen and zapped off with electricity – they were all painful and expensive. Worse the treatments kept leaving blank little white spots on my face!!! Finally about 4 years ago I decided to give Apple Cider Vinegar a try out. I reasoned that it was a weak acid. So I soaked small pieces of tissue and applied it to a couple of problem areas on my face that kept recurring. After 3-4 days it will scab up – just like your treatment for you mole – and then when it gets to that stage I stop the treatment, let it dry and it clears up and the skin returns to normal!!!! I have been successfully cleared up 4 spots that kept recurring for years and the doctors treatments never got rid of it. Apple cider vinegar succeeded where the doctors did not!!! will regular white vinegar work aswell? I have never seen white vinegar used in any health remedy so I would not recommend it for removing moles. I have been trying this method for about 2-3 days now! ACTUALLY, my mole is almost in the same place on my head, but it is right in my hairline and is by a substantial part of my hair. My biggest problem is I’m having difficulty placing the cotton ball over the mole without getting my hair caught in it! I’ve thought of many ways to try to tape around it and while I can say that my skin around the mole is effectively burning (sunburn style) and I see very slight change in the texture of the mole, it isn’t working as fast as other people seem! I only just now realized that the ACV I’ve been using hasn’t been organic. Though it is naturally made, it is simply 50% apple cidar, 50% vinegar. I had read from other places it wasn’t important as far as mole removal, but maybe I should pick up some organic? Organic ACV shouldn’t make a difference, but my ACV reads “organic raw apple cider vinegar. 5% acidity.” I haven’t seen any other ACV labels that read 50/50 like you mentioned, so perhaps it could be the ACV? Or it could be the difficulty with your hair too as you mentioned. I’d keep going. It may not work as fast with the environmental factors, but progress is still progress! Yes, it was so strange! It was generic, store brand ACV. I didn’t even realize it until last night that it was half vingegar, half cidar! “A and P” brand ACV must be very, very generic, haha! Today I picked up some Bragg’s at the store and the ingredients are drastically different! I noticed that the mole itself is losing color! I’m going to hit the skin around it with some aloe (I checked it today, I thought it was just a sunburn-ish burn, but it looks like I’ve been holding the skin to a curling iron, eek. Blasted ginger-sensitive skin!) and keep going with the Bragg’s! Hair line makes it hard, but the sooner it’s gone, the better! Hi there! Before I tried this, I did tons of research on it. It seems to be working for tons of people. I have had a few moles removed by doctors in the past. One botched it up so badly, that I have a 6-stitch scar on my hand. I have a few moles on my back, upper legs and one big one under my arm along my bra line. It had a thin “neck” to it (the part that is attached to the rest of my skin) and the brown part was the width of a bit bigger than a pencil eraser and round. Pretty gross and embarrassing since I was a kid. It has been 5 days now since starting this. At first, I didn’t protect my surrounding skin. I am burnt all around it. I’m also in tons of pain from this. 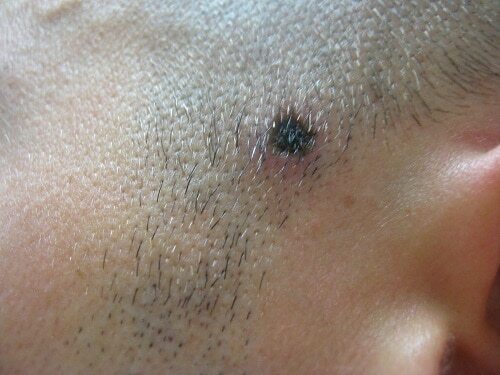 The mole itself seemed to swell for a day or two, then part of it turned black and scabbed. I guess due to it having a thin neck and big body, it was folding over when I put the soaked cotten over it, so only the outside of it got the ACV. Tonight I put pieces of tissue with ACV on it underneath the mole and then a cotton ball pushing down from the top. I medical taped that down after running the surrounding areas with Vaseline. Oh my gosh. So much pain. Feels like a stabbing pain. I dealt with it. 5 hour later I took everything off (10 min ago) and now the scabbed part of the mole is bleeding!! I don’t know what to do anymore. I was worried because only half of the mole turned black and scabbed. It also seemed to be taking to gravity and bending over, almost as if it was weighed down or that one part was dead. At this point I’m just in so much pain that I may wait for a few days. I haven’t seen anyone go through this. I figured I’d mention it because I don’t really know what to do. I don’t want to stop and have a half dead mole or something just hanging there. Any suggestions? I want to continue just maybe when my skin heals a bit. I’m sorry you’re in pain trying to remove your mole !! It’s very likely because the ACV is directly on the skin, whether on the outside or near the neck. Second, if the mole has turned black, it sounds like it is working – even if it’s partially. The odd shape of your mole may be to blame for some of the difficulties in removing it. You may want to consider letting your skin heal before continuing (if you decide to do so), it may be possible that the small piece left hanging will fall off shortly (on it’s own). Remember, we are not medical professionals, and can only relate to you our own experience. So it has been 1-1.5 weeks since I tried this method. Unfortunately, the mole has reappeared. Should I keep on trying, or will it never disappear? Have any other people had the same problem? Has it reappeared in full force? It seems strange that something so slow-growing, would be able to reappear so quickly. You may want to wait and see what happens, in case the area is just discolored from when you originally removed the mole. The area took a while to heal on my husband. Any questions, check with a medical professional as we are not one. 7days of using acv to remove my moles… its already black like dry… do you think its working? hi liza.how’s your mole this time? is it gone using the apple cider? This really works! Had a mole just “pop” up on my leg and it was getting bigger everyday. Saw this post and decided to try it. It was painless, except for the bandaid. That irritated my skin more than the vinegar. About a week later and it just fell off. I will continue applying vinegar to the area for a few days in hopes that it will not return as some folks have said they may. I am trying it now on an old scar that looks like a boil, hard and ugly. Had it all my life and now I see some changes after applying the vinegar just for a couple of days. Hope it works. Thanks for the great info!! I’ve been trying this method on a mole on my shoulder for a month now. It keeps flaking and seems to be separating from the skin a little around the perimeter, but it refuses to die. When it flakes, it bleeds, and it is very sensitive. How long should I keep this up? I read this post when researching using apple cider vinegar to remove moles. I decided to 5 moles that I didn’t like, all of them were slightly raised. I used organic ACV & soaked small pieces of cotton wool, I placed these on the moles. I used quite large fabric bandages over the top. I tipped the bottle of acv onto the centre pad of the bandage. I covered the moles at night time. During the day I spayed antiseptic tea tree (diluted so as not to burn the skin) and left them uncovered. After about 5 days the moles all looked blacker. On the first two evenings before applying acv I used an emery board to gently file the top of the moles, I was careful to not break the skin. I covered some of the moles with a bandaid in the day as the surface was red & the moles looked a little like scabs. I showered each morning & evening and patted the moles dry with cotton wool. After 7 days two moles were almost falling off, pink raw skin n was underneath. Today is day 8 and all the moles are gone, they were all a little different but basically the dark mole parts lifted away from the skin and with a little poke from a cotton ball they fell off. Only 1 mole had bleeding. The way the moles came away after 7 to 8 days of this process really surprised me. There are slight indents in the skin where the moles were & some red skin around the area from acv. I was careful to wash my hands and not touch the moles with my fingers during the week. I am really pleased with how this has gone. I’ve had moles removed by laser, freezing & surgical incision. At this point I’d say this is the least destructive process I’ve had to remove moles. I’d had these moles checked by a dr and they didn’t have signs of being melanomas so I was willing to try this DIY. If you’re going to do this I’d advise you eat well, include zinc supplements and maybe don’t do this if you smoke heavily or have poor circulation as your skin won’t repair as well. Be really careful with hygiene while you’re doing this procedure. The skin where the moles were looks like it’s healing well. I” really surprised how well this worked for me. In day 4 to day 6 when nothing much seemed to be happening I thought I’d made a mistake. But I continued and had a great result! No more moles! but I’m concern about the indents in the skin that you mentioned. I’m glad you asked. It’s 2 months since I finished using Apple cider vinegar on 5 moles. Two moles look much better, they’re flatter and lighter and really reduced. They were red for about a month. Before I used ACV they were all quite small and raised. Two other moles are smaller, and less obvious. I’m pleased with how these 4 have turned out. 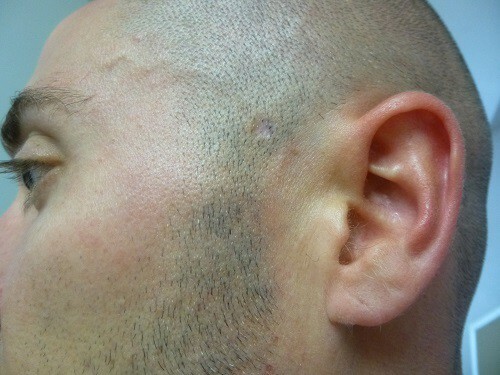 The fifth mole was originally flat, it reduced in size but the scar tissue is more red than the original mole. So maybe I should have left the flat mole alone. I think the moles I had removed by a doctor with a laser were better results, it really burnt all traces of the mole away. Michael, I would not remove a mole on my face. That’s my opinion. I think it’s worth putting money aside until you can afford to have a doctor remove it. Even if it takes you a year to save the amount you need, having a scar on your face is a risk with DIY. Google mole removal, there are some very good techniques some doctors use. If you really can not afford to save the money ever, and if you really hate the look of the mole, and if you are willing to risk having a scar on your face if it goes wrong. Then maybe it’s worth doing. I have no qualifications and I can not give you the right answer. When it comes to a mole on your face…maybe ACV isn’t the right choice. But, some people have found it works for them. I would not have removed my moles if they were on my face. This is my opinion. As the original blog article said, see a doctor before you do anything. I am being cautious with my reply, but I do think my DIY apple cider vinegar was a good result, but it was not a perfect result and I would not try removing a flat mole on my body again. Does it work the same with medical tape and band aids? I don’t know Jon, we’ve only tried using a cotton ball and band-aid. I got so many moles in my face. I really want to try this. How many days should I apply ACV on the moles? I’ve been using Apple cider vinegar on my mole for awhile now the scab is starting to fall off, I was wonder if I put anything on it after the scab is completely off to keep it clean? When I did this once before, I did not put anything on it as far as ointments. If it’s in a place that will get dirty or bumped like on an arm or foot, I could see putting a bandaid on it during the day. I tried this a few years ago on a mole on my back in it worked so well! It was only a little stingy and painful, nothing compared to the one I had chemically burned off by a doctor that then got infected and cause a big scar. I used brand new Eden brand raw ACV. Later, I tried it again on a different mole with a bottle of Bragg’s brand and it did not work. I am about to buy a new bottle of ACV and will be trying it again as I have at least 5 moles on my neck and face. Be careful if you have sensitive skin. I followed the directions to get rid of a new mole on my face. Everything was fine after the first treatment. But something went wrong during the second treatment. The mole seemed to dissolve but the area where the cotton ball had been is now red and rough feeling. I don’t have any aloe or coconut oil so I’m going to apply some neosporin before I go to bed. How did it go and by any chance was it a dark mole you started with? Because mine is. I tried applying it once but in a different method from another site. I put warm water on it for 15-10 minutes. Then I used one side of a Q-Tip and soaked it in the Apple Cider Vinegar. I just kind of rubbed it for awhile with the Q-Tip and it seemed to be working. It kind of looks like it’s dissolving. Under it it was turning red. I was afraid of a scar so I stopped. I don’t know Junior – I’d check with your healthcare professional first. So far so good about 4 days in and I had a raised mole that is quite a bump. But it has shrunk to half it’s size. I an unable to bandage it because it is on the back of my head in my hair. So u do small sessions one hour) in the evening because I have to hold the cotton ball. Thus will take longer because i dont have the acv on for more than an hour (my arm gets tired) have shoulder lenght hair and don’t want to shave or cut my hair. Any tips on what I can do to secure the cotton ball to my head without shaving or cutting my hair? Could you use a stretchy headband? Or tie it on with a bandana? I ended up shaving a little around the mole as the mole is on hr back of my head and stays covered as long as my hair is down. Though it hasnt fallen yet, it seems dead. Does the mole nid to fall ? It may take a little time for it to fall off once it turns colors. Give it a little more time and if it doesn’t improve, try some more ACV. It will eventually but I just applied the acv until it fell off. Depending on how big and deep the mole does go. I have a fairly small mole in diameter but it was quite a bump. It eventually mine came off on day 10. Just be patient. This is amazing info, both in the original post and all the replies. I’ve learned so much. Thank you very much for posting this information. I am going to give it a try, both on the moles and drinking a small amount each day for General Health. I like the idea of putting ACV into V8 juice. Love your website. I have tried this for one on my chest I had a huge one that was raised and very large. I used the ACV five times and I noticed the inside of the mole disappeared but I still have the noticeable outside skin of the mole. I have tried to place the cotton ball on top of the outside skin, because of it being on my chest I had to use duct tape, the bandages kept falling off. I am hoping the outside skin will go away after scabbing and healing is complete. I’m having the same issue as you, Crystal. My mole is a large one on my cheek! Did yours flatten out yet? Mine has not. I may re treat it with vinegar tomorrow. I got the mole off, but I really gotta warn people, use the petroleum jelly around the area, I didn’t because I hate the stuff, well I got a nice infection because I didn’t, I healed it with silver and bandages, but still, use some kind of protectant on the skin near it. It worked, being the stubborn idiot I am, I left the acv on 24/7 for 4-5 days changing it everyday, too much and I burned the heck out my arm. Now again, follow the instructions and it will be great. I’m fine and the mole is gone, but I made it 100x worse not doing it right. Lesson: read the directions. 😉 Glad you’re all better now! Hi Tiffany, not sure if you will get this…but did the acv leave scarring? I have a mole I want to remove below the corner of my lip and I’m aftaid of scarring. Mr. Crumbs has a small scar, but it’s significantly less noticeable than the mole was. He doesn’t mind, but it’s also where his hair grows. Not sure if that helps much! I have a couple of big moles on my neck and I had been looking for a way to get rid of them. I had long heard that acv was one way of getting rid of moles. This is the first blog post I have found which actually helps more than any other website I have been to. Maybe you should try putting aloe vera around the area.. I USED ACV AT NIGHT WHILE I WAS A SLEEP.AFTER THE 4TH MORN I TOOK OFF BANDADE AND WHITE STUFF DRAINED FROM MY MOLE WHEN I CLEANED IT..A RED HOLE WAS THERE.IS THIS OK? ARE SHOULD I STOP THE ACV? I did this and it took much longer than 4 days. I tried it on 3 moles. 2 were very small, about 3mm, and they took about 3 weeks each to scab over and when they did, there was no crater, one has a tiny colorless but firm dot where the mole used to be. The 3rd one, about 5mm just started to scab over, after a month of applying twice a day and bandaging. This one is taking much longer, but is also the most annoying of all. I have many others that do not annoy me but I’m happy to say 2 down, 1 to go! And if it takes longer than expected don’t give up, I think it just takes longer to work on some! hey bro what is your brand of apple cider vinegar????????????????????? They mentiiton it above but it’s by viva naturals, Organic Apple cider vinegar with the “mother” you can find a 32 oz on amazon… nothing smaller but well worth it. It worked for me in 4 nights. Thank you! It worked. I used this method on 3 moles, one was raised and had it most of my life the other two I actually had cut out before and they grew right back! This method worked, two of them in a hair zone took only 4 days, one bigger one that was raised took 8 and that was on my side… I wonder if it being in a non hair area, if it takes longer? Either way, they are gone and it’s amazing that this actually worked! I did use some medical tape to cover the edges of the band aid to help keep the moister in better. I did one on my neck as a test run a while ago, haven’t had a scar or anything you would never know! But they have currently got to the flat/blackening stage so I am just waiting for it to drop off. The other might need another dose of ACV. Thank you soooooo much for sharing this literally changed my life! I am applying the ACV during the day time, and leaving it off at night , so will see what happens in next few days . Hi there. Today I have applied my first acv cotton ball and I’m going to sleep with it on. Quick question you say up to 8 hours for 4 days but how much of a gap do I need to leave in between applications ? Thanks. Did my first night last night. Felt nothing but I’m perhaps existing too much too soon lol. I’m struggling to find plasters that actually stick once it’s going over something wet plus the Vaseline to protect the surrounding area but I’m sure I’ll find something. Been doing the acv for couple of days. Mole looks really scabby but I’m concerned it’s very red all around the mole. Is it infected ? Should I see the doctor? Hey Susan! Put the ACV on a cotton swab, use a band-aid to secure to your skin and sleep on it. Take it off in the morning! Do y’all think I could get rid of a mole I have in 2 months if I put on the ACV overnight? I have a formal dance coming up and I would like it gone by then. I don’t see why not. My husbands came off pretty quickly. Hello! I am curious to know that didn’t that mole reappear since then? Nope – it’s still gone to this day! Hi Carter! ACV 4 times and then stopped completely. Good luck!! I have a mole on the side of my face and used acv to get rid of it months ago, but it would always grow back after a month. I tried using acv on one night for 10 hours and it fell off only to regrow the next week. Do you guys leave the acv for a week straight or is one night good enough for removal? Hey! Same is the case with me. I tried to remove a mole on my face thrice with ACV. But every time it regrew after some time. i hv mole on my upper lips part how long it ll take to remove ??.. did it crater? Looks like it cratered your skin. 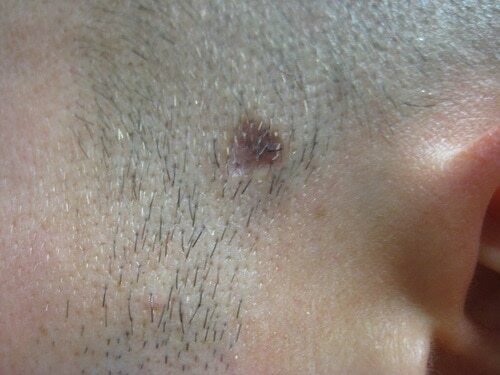 It did at first, but it’s since regrown and it looks like the rest of his skin – as if the mole was never there!